This is a wheel designed not only to get you up mountains on the hardest ascents, but the Zipp 202 will also to get you down again around high speed corners and on more uneven surfaces. Its the first wind tunnel designed wheel and weighs a mere 1081g per pair, giving you the minimal weight to take uphill, with a highly efficient roll. Zipps technologies also keep the 2009 version of the 202 ride comfortable, solid and smooth to hopefully carry on from its 2008 successes where the Zipp 202 was used in the Alpe d'Huez, the Olympics in Beijing and the Paris-Roubaix. 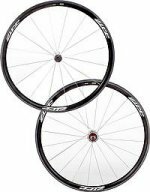 The Zipp 202 is available in front, rear and wheelsets and is exclusively a tubular wheel.